Yet another BBC investigation exposes the dangerous advice of homeopaths. When will the regulators take action to protect the public? BBC One Inside Out South West reporter Sam Smith was concerned at claims being made by homeopaths about vaccines. A researcher, posing as a mother of an unvaccinated child, emailed one of the most prominent homeopathic pharmacies, Ainsworths, and got a reply from Tony Pinkus, their Superintendent Pharmacist, who is registered as a pharmacist with the General Pharmaceutical Council. When asked if there was an alternative to the whooping cough (Pertussis) vaccine, his reply was appalling. Whereas I have been dispensing homoeopathic Pertussin 30c for 30 years for this purpose - and made sure I gave it to my own children, I am unable to make a claim for its success as there have been no successful trials reported. However, that did not prevent him suggesting several different homeopathic products to the researcher, including homeopathic Pertussin 30c, as a preventative. These products were, of course, all available online from his website. As a result of the investigation, to be broadcast on BBC One Inside Out South West this evening at 19:30, the medicines regulator, the MHRA, have told Ainsworths — and Helios, who advertised similar 'vaccines' — to remove them from their website. It appears they have now done that. But this isn't the first time Pinkus has been caught out by the BBC. In 2011, Newsnight reported on their investigation into Ainsworths suggesting sugar pills for malaria prevention. The General Pharmaceutical Council also investigated but let him off saying he had taken "remedial action". It seems that remedial action wasn't sufficient to protect the public from misleading — and possibly downright dangerous — advice. 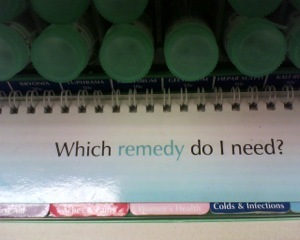 Many homeopathic products that included the names of medical conditions or diseases. They also had a 'remedy finder' that linked symptoms to some of their homeopathic products; something we believe is not permitted even for homeopathic products registered with the medicines regulator under their HR scheme. 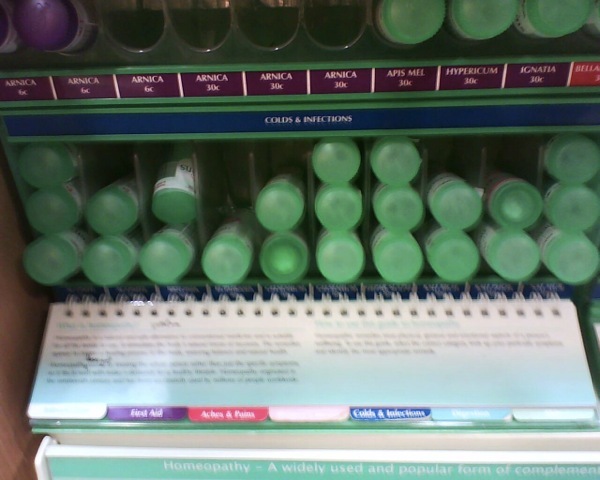 But Ainsworths were also advertising some 2,342 homeopathic products that appeared to be unlicensed and unregistered. We complained that the advertising, supply or sale of these was not permitted under the medicines regulations. Sixteen months later, we are still waiting for a substantive response from the MHRA and these products are still being advertised. It cannot be right that the only time a regulator acts to protect the public is when serious failings of regulation are highlighted by BBC investigations. It is time for the MHRA to grasp the nettle and fully and properly enforce the regulations that say it is not permitted to sell, supply or even advertise unlicensed homeopathic medicines to the general public — and that includes lay homeopaths. 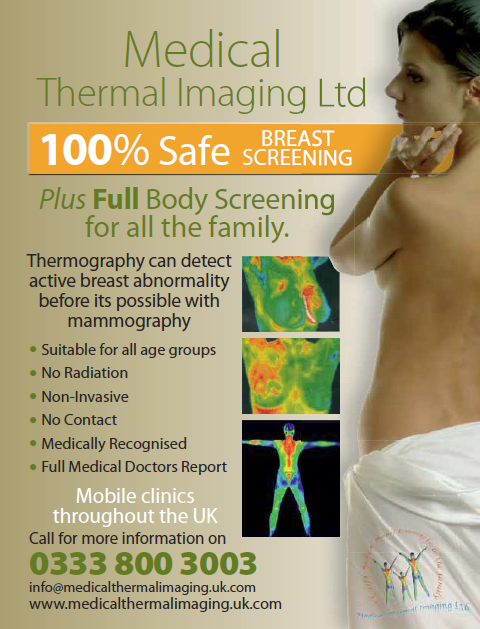 There is certainly a debate to be had over the benefits and harms of screening for breast cancer but there is no real debate over whether breast cancer can be reliably detected using thermography. Thermography claims that active breast tissue can be detected through the increased heat it generates compared to the surrounding tissue and this can be detected by a thermal imaging device. Whilst this might sound plausible and there may be some reason to believe this might be the case, there are many reasons to doubt claims about the effectiveness of thermography over conventional mamography. It's clear that thermal imaging of the breast is not as effective as imaging using xray. Breast screening itself needs debate as it produces harms. Using even less effective methods of screening is likely to produce far more harms in terms of false positives and false negatives. There's a reason why it's not recommended by UK regulatory bodies — it isn't effective enough. Thermography can detect active breast abnormality before it is possible with mammography. We challenged those claims and the Advertising Standards Authority have today published their adjudication, upheld on both points. In their response to the ASA, the advertisers, Medical Thermal Imaging Ltd, trading as Breast Angels, claimed that abnormalities released nitrous oxide which was then converted into nitroglycerin and this was detected by thermography. However, they failed to supply robust clinical evidence to substantiate the claims made in the advert. The ASA concluded that the ad therefore breached the CAP Code and was misleading. Since Breast Angels appear to be making similar claims on their website (in fact, they have a copy of the same advert), we sincerely hope that they take note that the ASA's adjudication, although about a magazine ad, applies to all other forms of marketing. Selling supplements is big business. Even though very few of us actually need them, that doesn't stop many manufacturers making bold announcements such as 'The future of Supplements has arrived'. Lypo-spheres are nano particles of encapsulated Vitamin C or GSH that give 98% delivery directly where it’s needed – into the cells themselves. Lypo-spheric Vitamin C is x10 more powerful than intravenous Vitamin C! …a wide spectrum of medical uses for vitamin C.
stroke, liver and immune dysfunction, heart disease premature aging and death. We challenged whether the advertiser could substantiate these claims. The ASA consulted the medicines' regulator, the MHRA, who said that this product was not a medicine but a food. The ASA therefore considered the product under section 15 of the CAP Code (Food, food supplements and associated health and nutrition claims). Instead of supplying evidence for the claims they were making, the advertiser accepted that the claims were not compliant with the CAP Code and gave an assurance that they will not feature in future advertising. Even though this was 'informally resolved', as opposed to an adjudication, the advertiser still gets a mention on the ASA's website today. We hope that the advertiser takes this opportunity to review his website for compliance with the CAP Code. This advert for yet another supplement appeared in the very first issue of What Doctors Don't Tell You and made claims about their product and Restless Leg Syndrome. Increasingly, they are turning to vitalCALM, a new natural supplement that deeply nourishes the brain and nervous system to improve dopamine levels/function and calm restless legs. The advertisers, Simply Vital Ltd, when contacted by the ASA, assured them that the claims will be removed in future advertising. They too get a mention of the ASA's website today. We sincerely hope that Simply Vital will remove similar claims on their website advert for this product and review the rest of their website to ensure it is CAP Code compliant, taking advantage of the free advice the ASA's Copy Advice Team offers if necessary. Now that the ASA have published the outcomes of half of our 26 complaints, it's a good time to reflect on the numbers. The ASA have been able to informally resolve ten of our complaints with the advertisers and so far have published adjudications on a further three. Those three ads alone have amassed a total of 17 CAP Code breaches. And there are far more to come. We will update this chart as the ASA publishes further outcomes. 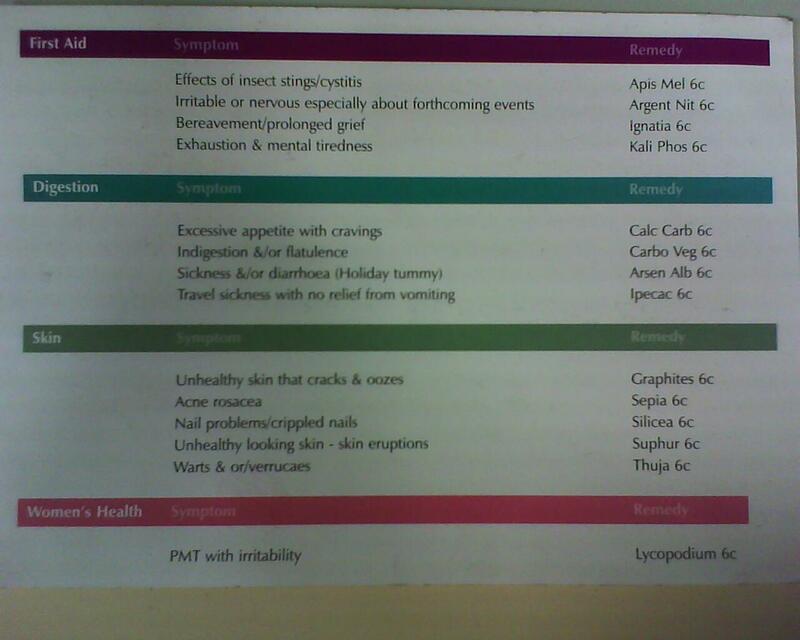 In November 2010, we complained to the ASA about a number of leaflets produced by the Royal London Hospital for Integrated Medicine (the renamed Royal London Homeopathic Hospital). The ASA's adjudication on their 'Medical and Clinical Hypnosis' leaflet is also published today. Hypnosis can benefit almost anyone to improve their physical, emotional and mental health. Research has shown that hypnosis can help regulate various systems of the body, such as the Immune System, Nervous System and Gastro-intestinal System. We questioned whether these claims could be substantiated. The RLHIM supplied the ASA with numerous clinical studies and research papers that they believed supported the claims. The ASA identified seven issues and the adjudication upheld all of them except two (chronic pain and cancer pain), concluding that they had substantiated those claims. However, it ruled that all the other claims were misleading, identifying a total of 15 breaches of the CAP Code. This now sets a precedent for all advertisers of hypnotherapy and we hope that other practitioners will review their advertising and amend as necessary. This is our second complaint against leaflets issued by the RLHIM; after the ASA informally resolved our complaint about their Marigold Therapy leaflet, the RLHIM removed their leaflet from their website and removed the corresponding pages from their service guide brochure, but they only removed their Marigold Therapy website pages after we complained a second time last October. The leaflet must not appear again in its current form. We told RLHIM to ensure that they held robust evidence to substantiate efficacy claims in the future. As we said above, any compliance action required by the ASA applies to all forms of advertising, not just the one the complaint refers to: if claims are deemed misleading, they will be misleading regardless of the medium of the advertising. We have several other complaints about the RLHIM's leaflets that are still being investigated by the ASA and we hope to publish more outcomes shortly. We will have several more informally resolved cases and full adjudications for you very shortly as the Advertising Standards Authority (ASA) work their way diligently through our complaints about 26 adverts in What Doctors Don't Tell You. Today we have one more to add to the growing list. We were originally told that the ASA were going to deal with our complaint against this ad under their formal investigations. They were going to ask the advertiser for evidence to substantiate the claims they made in their ad. However, the advertiser agreed to remove the claims from the ad and agreed not to use them again, so they get a mention on the ASA's website today. Some advertisers seem to be unaware that if an adjudication against an ad is upheld by the ASA or if they have agreed to remove claims in an informally resolved case, this doesn't just apply to the ad that was complained about. Misleading claims in one ad are just as misleading in an ad in another medium and they also have to be removed. This is particularly pertinent where the advertiser is making the same misleading claims on their website — these must be removed as well. The rules changed on December 14th 2012. On that day, new EU-wide rules on health claims came fully into force to join nutrition claims, which have been covered since 2009. 'Health' claims are those which refer to a relationship between a food or ingredient and health. 'Nutrition' claims refer to the nutritional benefit of a food. As many of our supporters will be aware, there are problems with many claims made for food and drink products. Of concern here are claims about health and nutrition. The new rules that came into force last week are based on REGULATION (EC) No 1924/2006 OF THE EUROPEAN PARLIAMENT AND OF THE COUNCIL of 20 December 2006 on nutrition and health claims made on foods. That's a bit of a mouthful, but it essentially boils down to the fact that only claims that have been authorised by the European Food Safety Authority are now permitted. European Regulation 1924/2006 on nutrition and health claims made on foods seeks to protect consumers from misleading or false claims. It also makes it easier for manufacturers to identify nutrition and health claims that can be used on any specific food product. …where the product contains no more than 0,12 g of sodium, or the equivalent value for salt, per 100 g or per 100 ml. There are even lower values for claims for 'very low salt' and 'salt free'. EFSA started by considering over two thousand health claims that manufacturers wanted to make. However, after looking at the evidence, they whittled them down to 241. That is still quite a number of claims that consumers have to contend with and weigh up. The full list can be found in the EU Register on nutrition and health claims — this will change as manufacturers submit new claims and scientific evidence that convinces EFSA that they should be authorised. That list also gives the 1,076 claims that they have not authorised. These regulations standardise claims and allow consumers to more easily understand the claims that are being made, rather than being confused by a myriad of 'clever' marketing ways of saying the same thing. The ASA has always dealt with food claims in advertising that was within their remit. With these new regulations in place, the ASA have amended the CAP Code to match. Past ASA adjudications will be applicable to the extent that they relate to the interpretation of a claim. However, for the most part, when it comes to the evidence required to substantiate a health claim, the new regime will supersede previous ASA adjudications. This means that health claims which the ASA may previously have accepted may no longer be considered acceptable (as this adjudication shows) and vice-versa. 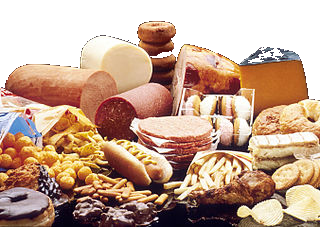 Please see our AdviceOnline article Food: Health Claims here. Any general health claims in an ad will need to be accompanied by a specific authorised health claim. ‘General health claim’ is likely to have a fairly wide interpretation; it will not just apply to claims such as “healthy” and “good for you”, but also claims like “superfood”. This requirement is stricter than the previous position when advertisers were required to hold evidence for such general claims because it requires that the specific authorised health claim is stated in the advertising copy. Please see our AdviceOnline article Food: General Health Claims here. 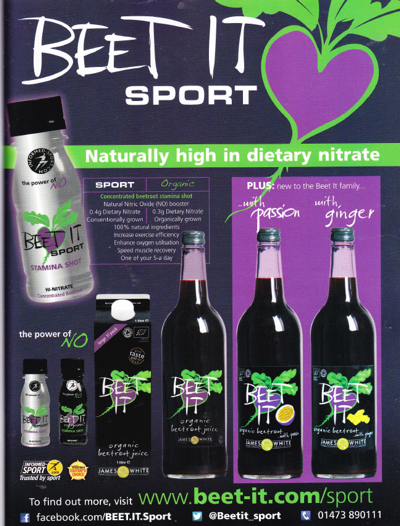 Our complaint against Beet-it juice was about an ad published before the new EFSA regulations came into force. But they still fell foul of the ASA's CAP Code in force at that time and it seems they certainly fall foul of the new EFSA regulations. We hope that the advertiser appreciates that they have responsibility to abide by the CAP Code and remove those misleading claims. Another two informally resolved cases and our first adjudication against an advert in What Doctors Don't Tell You. That now makes four informally resolved cases for seven adverts and one adjudication upheld against two ads. The latest two cases the Advertising Standards Authority (ASA) were able to informally resolve with the advertiser without having to resort to a formal investigation were published last week. 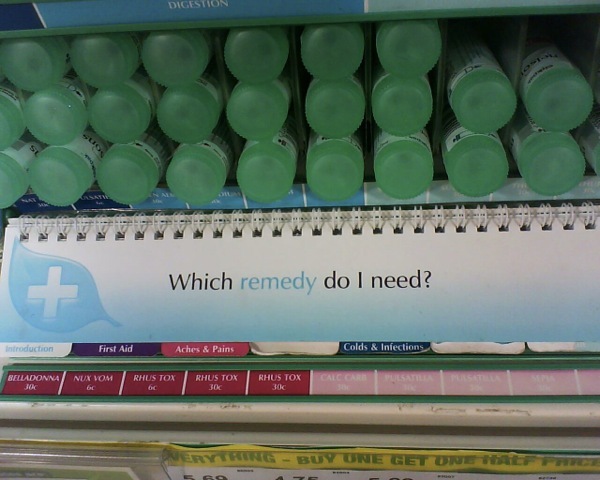 These were against four ads by the General Naturopathic Council Ltd and one ad by Asthma Care Kent. 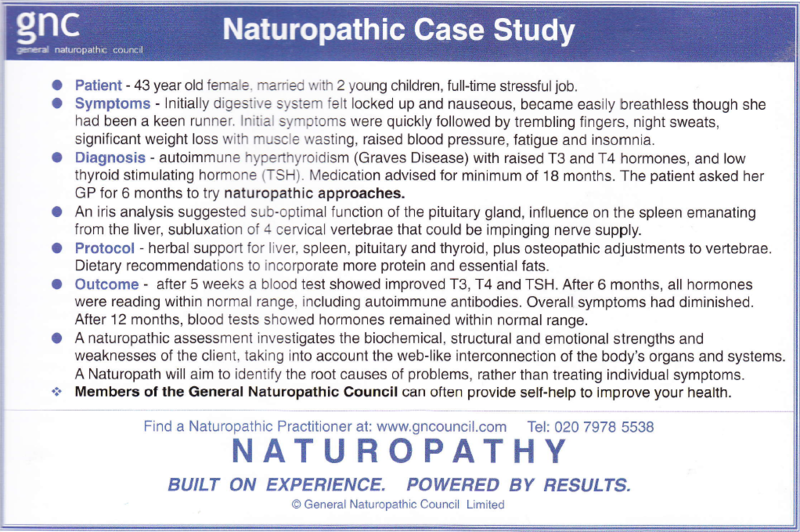 a case history taken by a 'Naturopathic Nutritionist Therapist' who identified factors that could influence the release of histamine or inhibit its degradation in the body. Needless to say, most of these could be helped with dietary adjustments, osteopathic adjustments, herbal products or the ubiquitous supplements. 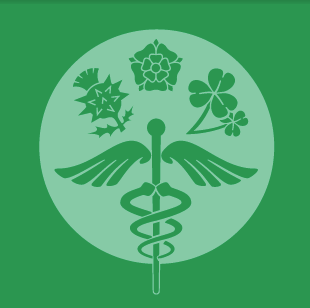 …to regulate and support naturopathic practitioners in order to ensure the safety and wellbeing of the public. Prevention is better than cure! The Naturopathic Practitioner makes use of supportive physical forces and agents such as: light, water, air, thermal effects, magnetism, earth, electricity or vibration; and seeks to harness the patient's own life force more directly with massage, through rest, by exercise, by stimulating reflexes, by making dietary prescriptions, by psychotherapeutic interventions or by employing the patient's own heterostatic capacity. The Naturopathic Practitioner may achieve alterative effects by a number of therapeutic approaches, for example: acupressure, acupuncture, colonic hydrotherapy, homeopathy, hydrotherapy, iridology, kinesiology, massage therapy, nutritional therapy, osseous manipulative therapy, phytotherapy (herbal medicine). We challenged whether these 'case studies' were genuine and that the iridology and iris examinations were valid diagnostic techniques. The ASA told the advertiser to outline proposed amendments to their ads so they complied with the CAP Code. Since we don't know what was said between the ASA and the General Naturopathic Council, we will need to wait to see their next ad (if any) in WDDTY to find out how they've had to change to comply. c. Advertising shall not contain claims of superiority, specialism or curability and any other claims made shall be capable of substantiation. d. Advertising shall not be false, fraudulent, misleading, deceptive, self-laudatory, extravagant or sensational. f. Advertising shall comply both with legal requirements and with the British Code of Advertising Practice [the ASA's CAP Code]. It would have been hoped that the GNC would have applied those same rules to its own advertising on behalf of its members. 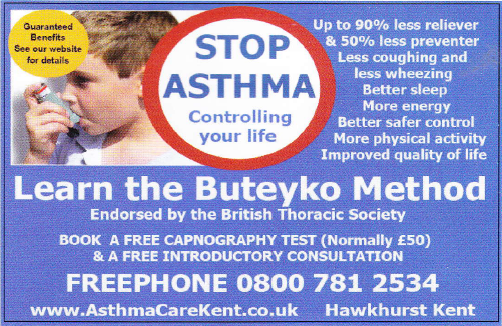 This was another ad for the Buteyko method of breathing that claims to significantly improve asthma. Some of its proponents claim that asthma is caused by 'over-breathing' and that asthma can be helped by breathing less using their proprietary method. We challenged all these claims, saying we doubted the advertiser could substantiate them. The ASA told Asthma Care Kent to remove all the efficacy claims for the Buteyko technique. All the cases so far have been informally resolved by the ASA. This means that the ASA simply told the advertisers to remove claims they considered were not allowed by the CAP Code. Our first ASA adjudication against advertisers in What Doctors Don't Tell You is published today. 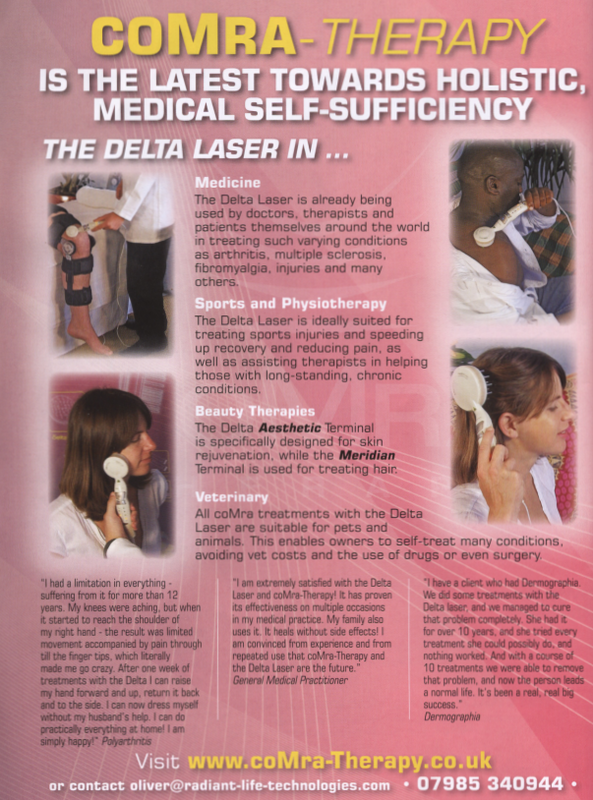 This was an ad for something called a coMra™ 'delta laser' device that provides coMra™ (coherent multi-radiance) therapy. 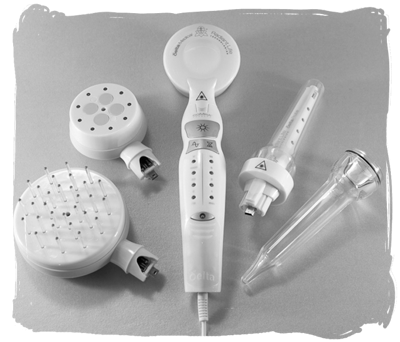 The company that manufactures and sells this device is Radiant Life Technologies. There were two different ads: a full-page ad in the September issue and a half-page ad in the October issue. 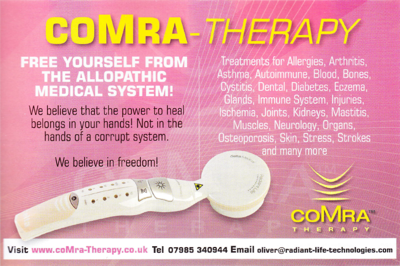 coMra-Therapy is a non-invasive therapy, which combines an infrared laser with a magnetic field, ultrasound and colour LEDs in a fully coherent treatment. Free yourself from the allopathic medical system! We believe that the power to heal belongs in your hands! Not in hands of a corrupt system. But the list of 'treatments' on their website is even more impressive. We challenged whether they could substantiate those claims and whether the three testimonials they gave in the larger ad were genuine. Radiant Life Technologies should already have been well aware of what they are and are not allowed to claim in ads: they had fallen foul of the ASA last year and the adjudication against them is well worth reading. Radiant Life Technologies said they could substantiate the testimonials to any competent authority should the need arise. However, they declined to supply a substantive response to the ASA's enquiries. 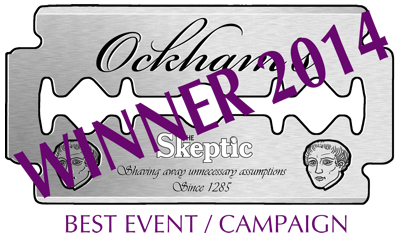 Needless to say, in the absence of evidence for the claims, the ASA upheld our complaint. But we couldn't leave it at that. The ASA is considered the 'established means' for gaining compliance with the Consumer Protection from Unfair Trading Regulations 2008, which governs how businesses interact with consumers and the Business Protection from Misleading Marketing Regulations 2008, which governs how businesses advertise to each other. This means that the law itself is not usually enforced formally through the courts; instead the ASA is first allowed to tackle any problems under the Advertising Codes. This approach works well in the overwhelming majority of cases. They can take matters further, of course, by referring advertisers who refuse to work with them and persistently make misleading claims to the Office of Fair Trading (OFT) for legal action. However, in this case, we have an alternative route and we wanted to give Radiant Life Technologies the opportunity to provide their evidence to a suitable 'competent authority', even if they didn't think the ASA worthy of such an accolade. We wondered if the MHRA were competent enough for Radiant Life Technologies, so a complaint about the coMra™ device is now in their hands. Back in October, we told you of the complaints about the 26 adverts in the first two issues of the new monthly magazine What Doctors Don't Tell You we submitted to the Advertising Standards Authority (ASA). The ASA have been working on resolving our complaints and have started dealing with just about all of them. Many will be informally resolved by the advertiser agreeing to remove the claims the ASA find unacceptable. Others are being fully investigated by the ASA, asking the advertiser for the evidence to substantiate the claims made — remember that an advertiser must hold that evidence at the time the claim is made, not just come up with it later when challenged. If they cannot supply that evidence or it is not up to the ASA's standards, they are likely to lose the adjudication with full details published on the ASA's website for all to see. Today, the first two of the informally resolved cases are published. 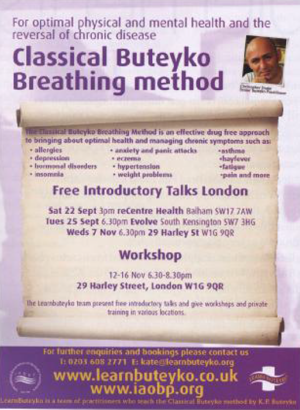 The Buteyko Breathing Method purports to be a breathing technique that can help with conditions such as asthma. 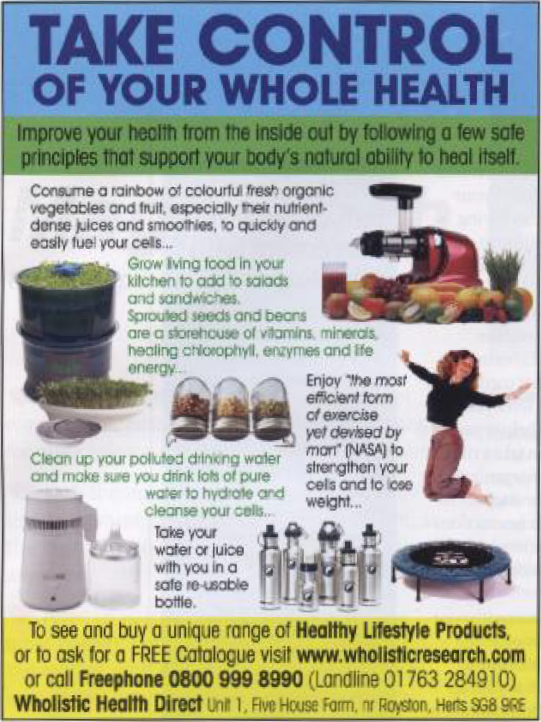 The ad appeared in the September issue of WDDTY. There were smaller, 1/8-page ads in the first three issues, but these made no claims. We questioned these claims. The ASA agreed with us that we had a valid point and told the advertiser to change their ad, instructing them to remove all efficacy claims for the technique. Because it was informally resolved, all the ASA publishes is basic details of the case — but the advertiser is still named. Similar claims are made on the learnbuteyko.co.uk website and we hope the advertiser will take this opportunity to ensure the website also complies with the ASA's CAP Code. There were two different ads in the first issue and one of them repeated in the second, all making the same claims. The ads were by Wholistic Research for their water filter product. We challenged the claims and said we believed it could make readers worry unnecessarily about their drinking water and put undue pressure on them to buy the product. The ASA initially decided to investigate and ask the advertiser for evidence. However, the advertiser agreed to change the wording in future ads to resolve our complaint. The advertiser should now be well aware of the ASA's CAP Code and I hope they will ensure that the ad on their website for their water filters also complies. There are many more informally resolved complaints and adjudications to come and it will no doubt take some time, but we will let you know the progress. Meantime, we will not be complaining about any of the ads in the latest (November) issue. The ASA need time to do their job and deal with the advertisers — and with the magazine publishers if necessary — to ensure that the ads in any future issue comply with the CAP Code. However, we are keeping a detailed tally of the ads. In the September issue there were 38, 35 in October and 35 in November. Many of these ads are the same or very similar, but what is interesting is that there are only 39 different advertisers in total over the three issues. Out of 100 pages per issue, that doesn't seem like very many. This really should have been very simple — and sorted out a long time ago. 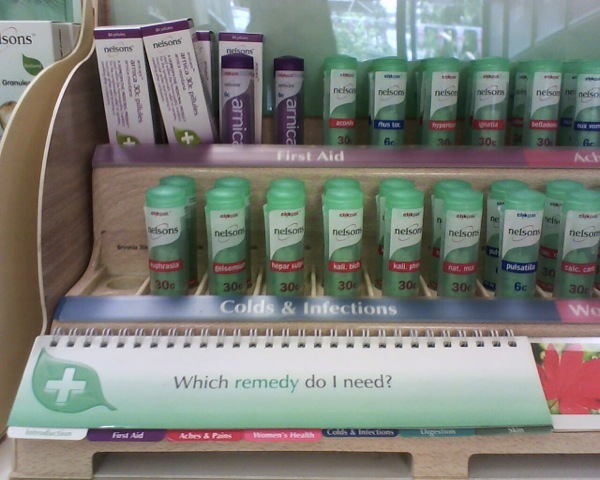 Holland and Barrett advertises the Nelsons homeopathic products it sells in its stores. The advertising of these products is controlled by regulations and enforced by the medicines regulator, the MHRA. The advertiser should already have known and understand those regulations and what is and isn't permitted when advertising these products. But it seems they didn't know. After a complaint from us, the MHRA told them to ensure they complied and Holland and Barrett told the MHRA they would take action to rectify the situation. That was at the start of 2012. Then in July, we found out that they were still not complying with the regulations, so we submitted another complaint to the medicines regulator. 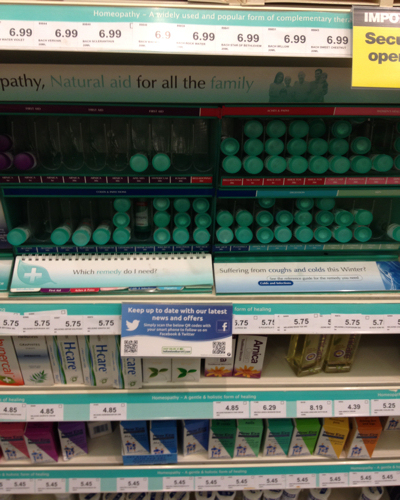 We sent them photographs sent in by our supporters from eight Holland and Barrett stores up and down the country that still had the point-of-sale advertising that the MHRA had told them was not permitted. Note the different format of the advertising in the Stortford store. This sorry tale started last December — and it's still not successfully concluded. 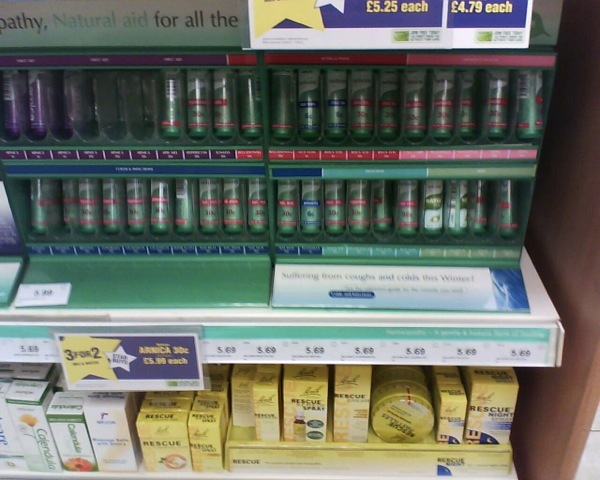 The Nightingale Collaboration complained to the MHRA about point of sale advertising of Nelson's homeopathic products in six Holland and Barrett stores and advertising on their website. The complainant was concerned that the advertising included indications for use but the products were not licensed with indications. A similar complaint investigated in November 2011 concerning the same point of sale materials and website was upheld and Holland and Barrett had agreed to withdraw the materials from all stores and review their website. The MHRA upheld this complaint. 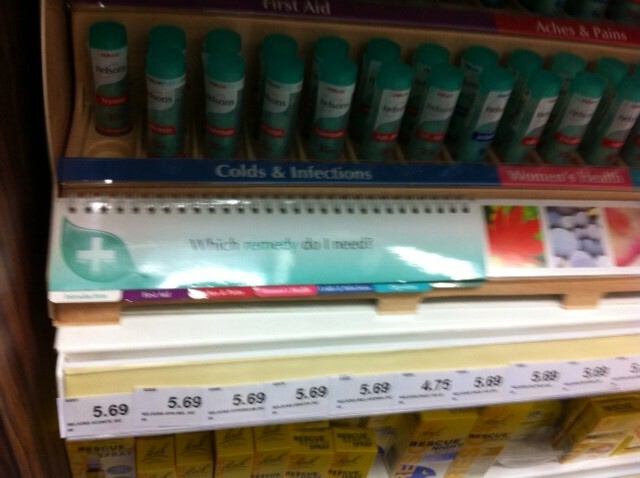 Holland and Barrett stated that the advertising materials were displayed in a small number of stores due to a miscommunication. They issued another communication to withdraw the advertising from their stores and amended the information on their website. We have once again been in correspondence with Holland and Barrett again and have completed our investigations. You may wish to know that the point of sale materials were mistakenly displayed in Holland and Barrett stores and have now been withdrawn from the stores. Holland and Barrett have agreed that we can make a copy of their response to your complaint available to you. This is enclosed and provides their comments on this advertising feature and addresses the concerns raised in your email of 12 July 2012. We were made aware around middle of July 2012 that a very few H&B shops had not removed the booklets as we had instructed late last year. It had come apparent that this was due to some stores having another booklet that was not displayed to customers but was sent out by the suppliers 'Nelson' previously to help our store staff with knowledge of the products. Hence certain stores assumed that this was the booklet referred into the recall and not the one that was displayed. Therefore we re- issued a new memo to the stores clearly advising of the booklet displayed on the shelves next to the products that need to be removed. Please see attached a copy of the memo sent. We have called all the stores listed in the complaint letter and they have all removed the displayed booklet and sent it back to depot since this revised memo was issued. It was all a mix-up and miscommunication, apparently. 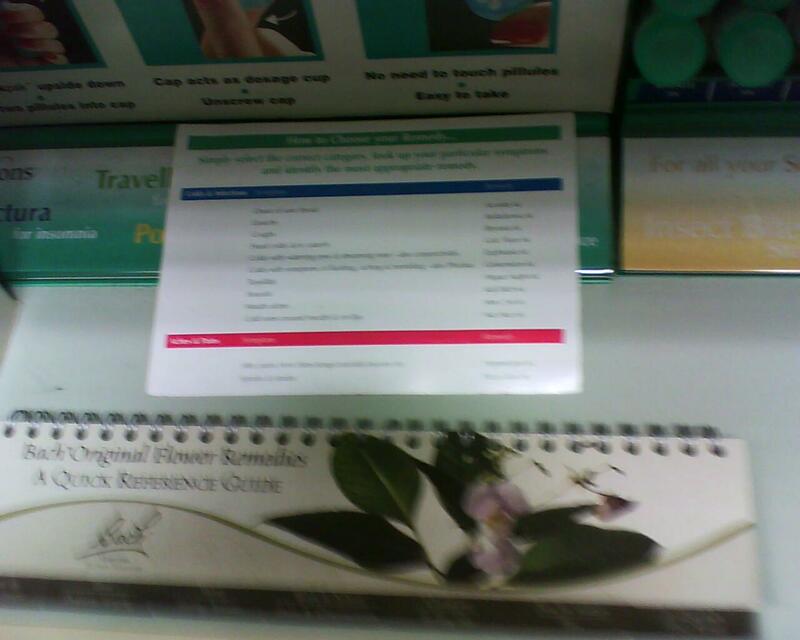 "WHICH REMEDY DO I NEED"
Subject: Nelsons Homeopathic Booklet "Which Remedy do I Need"
A recall was put on pulse back in December 2011 for these booklets to be removed and returned back to depot, however it has been bought to our attention not all were removed and/or returned. Therefore can you please check if your store still has this booklet on display or is still available in your store. If so, remove the booklet from display/store immediately and also any other POS notices with the Nelsons range products that have a reference to the booklet. Nelsons Homeopathic Booklet "Which Remedy do I Need"
Action Required – Please check to see if you still have the above booklet in your store next to the Nelsons Homeopathic products or in store, if you do then remove immediately, place in an envelope (with your store name and number on the front) and return to the warehouse with your delivery driver for the attention of Technical Services. You'd have thought that that would be the end of it and that all Holland and Barrett stores would all now be complying with the medicines regulations. Needless to say, a third complaint has been submitted to the MHRA.